“I needed a realtor to sell my father’s home as part of the probate of his estate. I live in South Dakota and was not familiar with the real estate market in Phoenix. I interviewed several real estate agents and it was immediately apparent to me that Ruth Anne was far more knowledgeable about the market than the others I interviewed, particularly with regard to gated communities. My experience with Ruth Anne absolutely confirmed my initial impressions. She provided me with excellent advice regarding marketing and selling strategies for purposes of the original listing. She also provided excellent guidance in terms of dealing with various offers and contingencies. She was also extremely helpful in completing the numerous forms and disclosures which were part of the sale. “In 2005, my wife and I purchased a home in The Sunbird community in Arizona. We purchased it as a retirement home so we could snowbird and be close to our Grandkids. In the meantime we had the house rented and Ruth Ann Hobbs was our broker from day one. Thank God for her! She took care of everything. There was never a problem with the tenants that she found for us. Over the course of the last ten years, sometimes there were problems with the house. (As these things tend to happen.) A leaky faucet here, an overflowed toilet there and so on. This needed to be replaced and that needed to be repaired. SHE TOOK CARE OF EVERYTHING! We live in New Jersey which means we were 2500 miles away from the property. DYI was totally out of the question. She knew who to call, both for the quality of their work and the price that they charged. She shopped around and from her extensive knowledge of the area always came up with the right person. The house was recently sold and she was on top of everything. (The grandkids are now in North Carolina. Buying a home? Selling a home, or need your home rented in Arizona? “Just a minute to thank you for your promptness of putting our house on the market. The professionalism of your staff has very much been appreciated. Your photographer is an expert with his camera and it shows with the flattering pictures he took of our home. Many thanks! 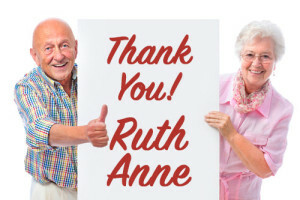 Thank you Ruth Ann for your patience in our trying to figure out what we want to do in the housing market. A big decision for us.